Chefs Kyle Bailey and Tiffany MacIsaac are probably recovering this morning after a packed opening night at Birch & Barley and ChurchKey. The husband-and-wife team were tapped to helm the kitchen at this new Neighborhood Restaurant Group addition. Bailey is the executive chef, while MacIsaac oversees the sweets (a housemade Hostess cupcake!) and breads (don't miss the pretzel roll). 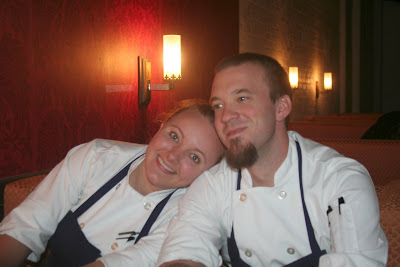 Both chefs were previously at Allen & Delancey in NYC. Prior to that, MacIsaac was pastry chef at Cru. Bailey was at Blue Hill at Stone Barns and Cru before that. MacIsaac says they always go "halfsies" when they dine out, eating half of the plate, then switching. "It is the best way for us to analyze and discuss what we are enjoying!" she says. 3. Burger at Firefly. "So simple, but often the burger is an afterthought. Chef Danny Bortnick's was perfect. So juicy and flavorful!"